Batista officially announced his retirement from WWE !! As we had seen a brutal match between Triple H and Batista at wrestlemania 35, where Triple H had defeated Batista and secured his career for the future. But what about Batista? 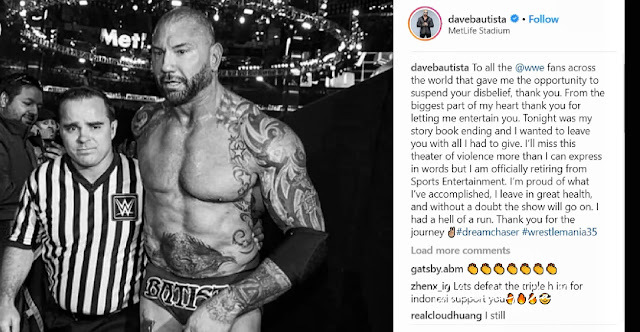 So let tell you that Batista had officially announced his retirement from WWE on his instagram account. 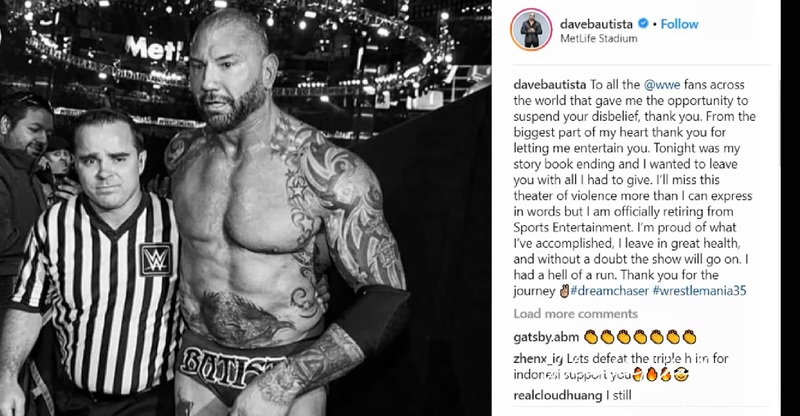 As you can see on the above mentioned picture where Batista firstly thanked the whole wwe universe and then he stated his retirement from the WWE company. Batista also addressed that he gonna definitely miss the WWE company and its universe. After that he stated that he always feels proud after recognizing his journey in the WWE and what he accomplished in the company. So now Batista had officially announced his retirement from WWE. And now we gonna never see Batista competing in the ring. It could possibly that in future we see some appearances of Batista in the WWE company but we definitely not gonna see any of his match. So readers.. This was all about in this update. We hope that you liked this update. Also let us know in the comment box below that are you all happy with Batista's retirement from WWE?
. The Undertaker's next match revealed!
. Seth Rollins is your new universal champion! So readers.. Are you all happy with Batista's retirement from WWE company?